Polishing wood the traditional way may not be an easy feat to achieve for most. But, newer formulations in the gray wood stain department has simplified the overall task of wood coloring to a great extent. However, to know what consistencies and formulations would suit the kind of wood you’re preparing to stain can still be challenging. And right now if you’re gearing up to create that stunning wooden table top or refurbish an existing one, then we have all the product reviews, directions and ideas ready! So, all you need to do is sit back, relax and go through the following guide to know everything about the best gray wood stains! 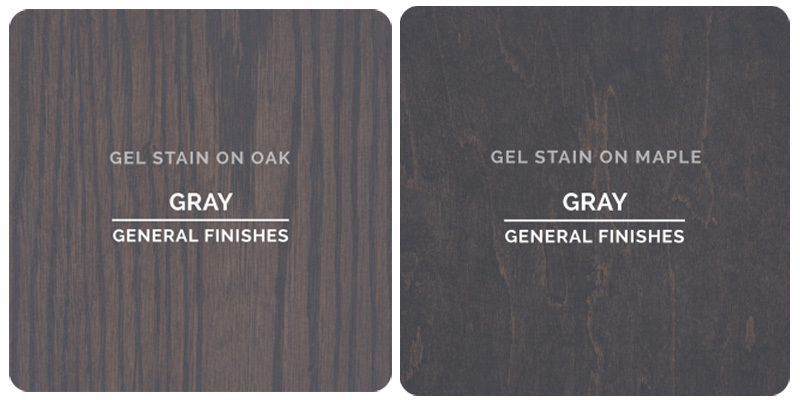 The General Finishes gray wood stains are one of the easiest wood stains to apply. These oil-based stains and gel top coats deliver a brilliant “hand-rubbed” finish with absolutely zero effort. The rich and luxurious texture of these gel stains ensures a consistent color control with no uneven color absorption or penetration into the wood that otherwise might leave patches. These produce a high-shine lustrous finish which could even be achieved on woods such as pine or aspen that are comparatively difficult to polish than others. It is advisable to use this product without sanding between coats and using a quick final coat or “re-coat” for far better results than conventional stains. Simply use a lint-free piece of cloth or soft foam brush; forget about elaborate procedures and time-consuming efforts, spills or splashes! This water-based wood stains give you all the benefits of the traditional wood stains with an oil-based formula. The application is exceptionally easy thanks to a thick and rich texture. The consistency is such that it spreads evenly and could be blended or repaired according to the requirements. It produces high-quality, luxuriant dark color-tones that could be mixed with other GF water-based wood stains, top-coats, and paints to achieve custom colors or tonal variations. The thick formula ensures total control on color penetration that reduces blotching or patching on more delicate woods such as maple, pine or aspen. 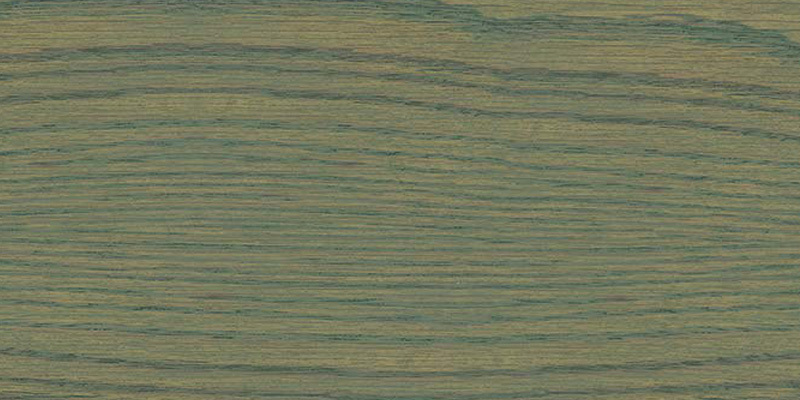 However, it could be a bit finicky to use on grained wood textures as too much of the product could dull the grains. Minwax gray wood stains are richly textured, oil-based wood finishes that delivers a stunning, long-lasting finish for natural grain wood furniture. This sinks deep into the surface, penetrating into the wood fibers to accentuate the grainy texture of the wood. This also makes it a protective sealant for the wood. It looks especially beautiful on any stripped or bare wooden surface. It is an ideal staining medium for all kinds of unfinished wooden furniture including wood doors, cabinets, molding, hardwood floors, and trimmings. However, finishes for this gray stain could turn out to be a bit matte and might require a bit of experiment with a few extra coats. Delivers an enduring, dark color to any grainy, wooden furniture. Oil-based stain texture sinks deep into the wooden pores to emphasize the grains and protects the wood. The Saman Urban Gray Stain has one of the most consistent coverages ever. It is a water-based wood stain that penetrates deep into the wood fibers to emphasize the natural grain of the texture, without raising them. This wiping stain does have an incredible consistency which allows for very easy application. The coats do not leave any overlapping marks as such and require no additional treatment with a wood conditioner. Yet, the only issue with this product is it can splash and run quickly, so be very careful about your surroundings and clothes while using it. The Varathane wood stains dry fast and give a stunningly consistent and opaque finish thanks to the “nano-pigment particle” technology it is endowed with. This is an ideal staining medium for all indoor wooden furniture that delivers a premium color effect in just a single wipe down. It has a super-fast drying characteristic that instantly seals the color deep into the wooden pores, hardening within the first hour. 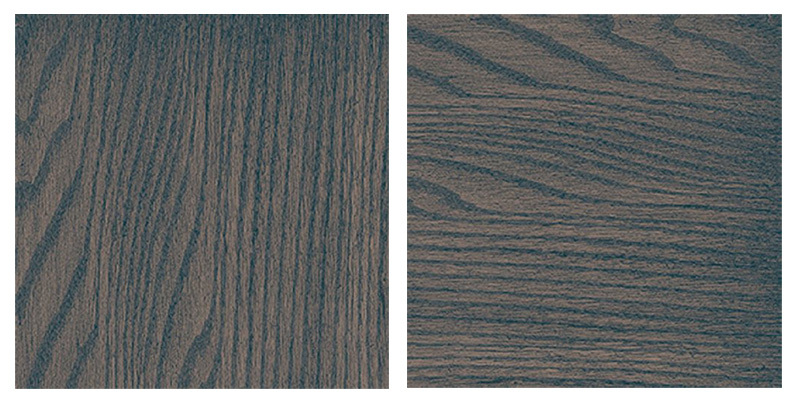 This highlights the natural grain of the wooden texture and sets in a darker and richer tone over time. However, if you feel that the initial coat to be a bit too solid or opaque (which can be the case with this product), then do consider going for milder concentration and avoid waiting for the recommended 2-3 minutes before wiping down. Standard, premium grade finish in the first coat itself. 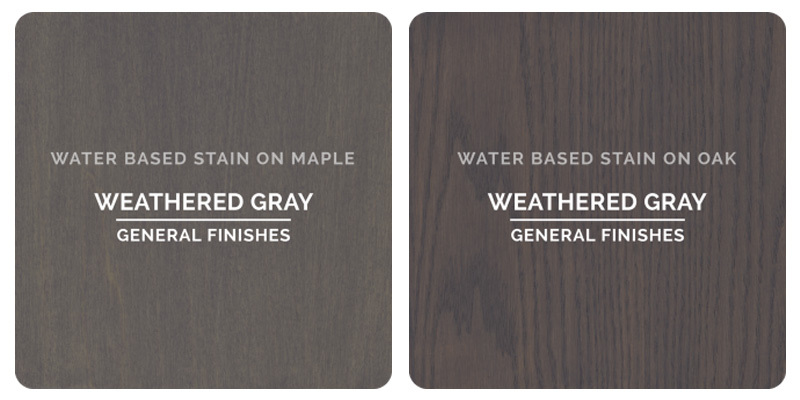 The Varathane Weathered Gray Stain is another great tone of the oil-based wood stains from this brand. This is ideal for all indoor wooden furniture such as doors, cabinets, paneling, and trims. The unique “nano-pigment particles” technology ensures that you get a rich coat in just a single swipe. This can be used on any interior wooden furniture. This stain complements the natural color of the wood by providing a rich, dark tone and accentuates the grains on the wood to bring out its natural beauty. It dries down within an hour, yet continues to darken for a while after that. 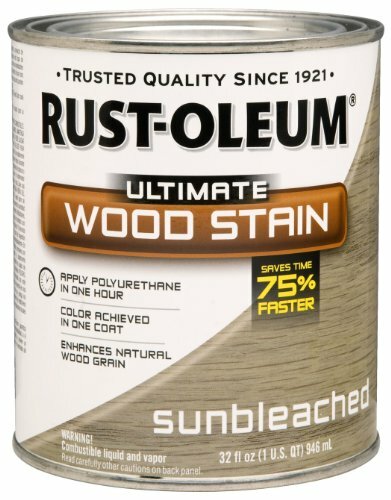 Similar to the Varathane stains, the Rustoleum Sunbleached Stain is formulated with nano-sized pigment particles that ensure even and rich color consistency. This delivers an even tone in the first coat itself drying down to a darker shade within an hour. This could be applied to any kind of furniture, but as long as it is used for indoor purposes. The color sinks down and settles deep into the fibers, emphasizing the grains on the surface. However, the consistency could be a bit light and may require a couple of extra wipe downs. Also, the product is runny and can spill all over the place. No pre-staining or conditioning is required before or after using the product. 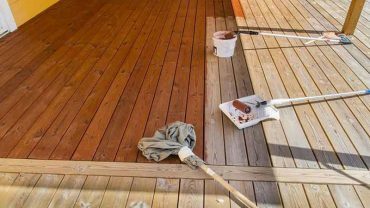 The first step to prepping up a wooden surface for staining is to correctly distinguish between the different kinds of wood and select one for the purpose. Hardwoods such as oak and beech will take a few extra layers of coats than softwoods such as pine and cedar. Consider using a wood conditioner for ensuring an even coat, otherwise, it may get blotchy or patchy. Sandpapers play a vital role in revealing the true textures of both the wooden surface and the layers of coats that go on it. These are the simplest to work with. Simply use a foam brush or lint-free piece of cloth to wipe down the initial layers. Use the appropriate grade of sandpaper to buff down the coats. Remember that a lower grit number on the wood makes it rougher and the stains will absorb more deeply and give a darker color even on the first application. And, the reverse is also true where a higher grit number will absorb a lesser amount of color and will yield a lighter color. Using lower grit sandpaper on flat surfaces will remove any scuffs or blemishes. Also, to accentuate the grains and colors you can sand down gently between coats. Wooden surfaces with an existing finish may be a bit difficult to maneuver when it comes to staining, as the surface would have already had its share of pre-staining treatments on the first go. Be very gentle with sanding pre-finishes. Be sure to remove the stains entirely from the surface. You can use a protective conditioner at this point in time after sanding to treat the damaged surface. Put the initial layers of stains. Let them dry completely. You can sand it down a bit before applying the initial layers. Oil-based stains provide a lasting color, penetrating deep into the fibers. These protect the wood and accentuates its natural hue. Water-based tints and stains ensure an even color with limited penetration into the wood. Pastels are generally oil-based tints that deliver beautiful pastel shades, accentuating the grains on the texture. Pigment and dyes can only do so much than just provide a normal color to the wood. Use a pair of gloves before applying stains. Be very careful while handling these as they could spill. Make sure the surface of the wood is clean before applying stains to it. Make sure to apply the coats in singular long strokes in the direction of the grains with a foam brush or a lint-free cloth. Let the stain sit for around 10 minutes so that it can sink into the fibers before applying the next coat. Also, make sure that it is absolutely dry before going in with the sandpaper otherwise the damage could be irreversible. 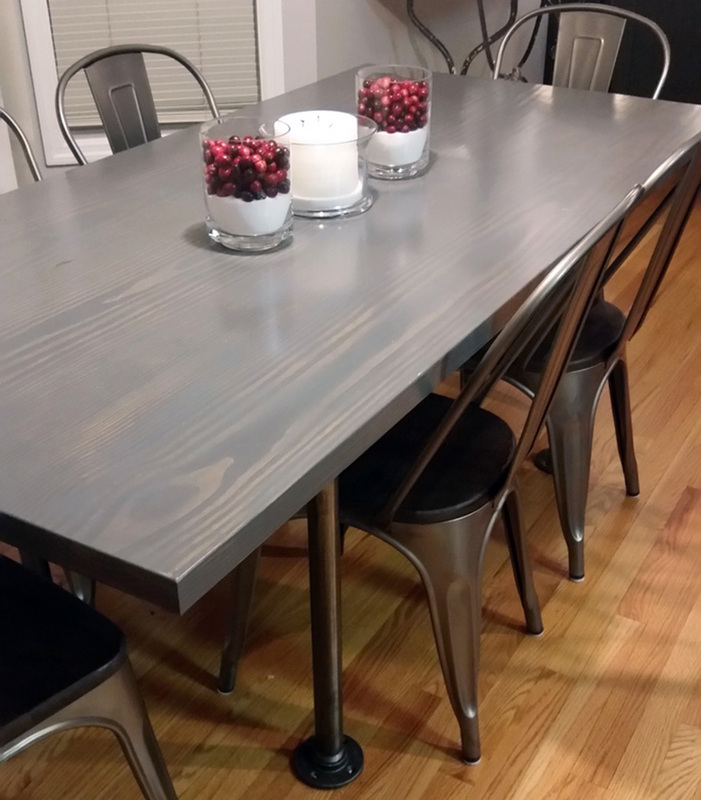 A polyurethane topcoat on the gray wood stained surface protects and adds all the shine to the furniture. You can avail this in a semi, clear or high-shine gloss finishes as well as satin textures. If you’re using the spray type make sure to hold the can at a distance of 8-12 inches away from the surface while you’re at it. Avoid over-spraying and maintain long and even passes. Leave it for a couple of hours before you reapply (if more coats are required). 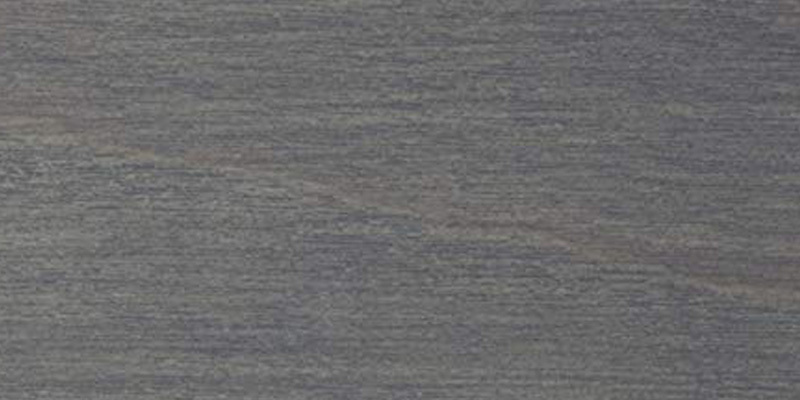 One of the classic looks that could be whisked up for your kitchen cabinets is the contemporary cedar finish using a gel gray wood stain medium. This strikes the perfect balance between a traditional and modern approach to cabinet decor. 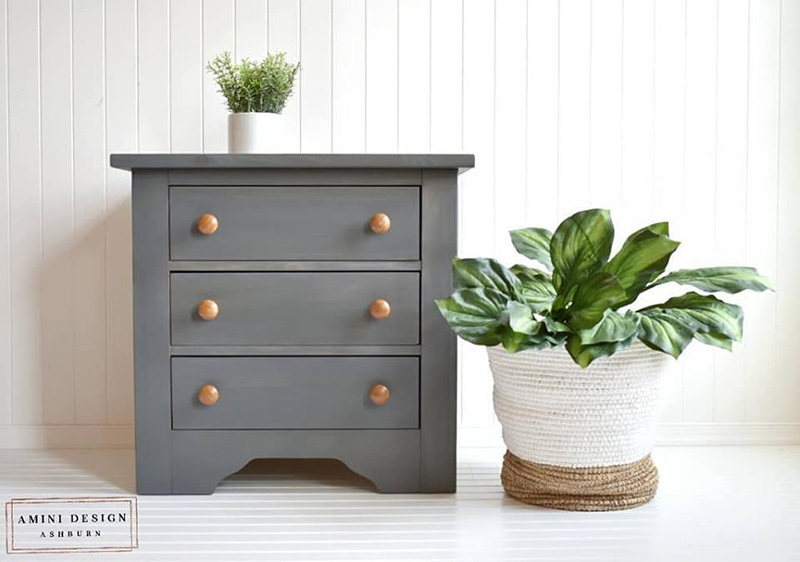 An ash or steel gray wood stain finish applied to a sanded raw wood Broyhill dresser can bring about a glamorous vintage look. Both high-shine satin or cooler matte finishes look stunning on this. The Rustic Farmhouse Table is unquestionably an incredible interior decor statement. And this could be easily achieved with liberal coats of Gray Wood stains in either oil or gel-based formulations. 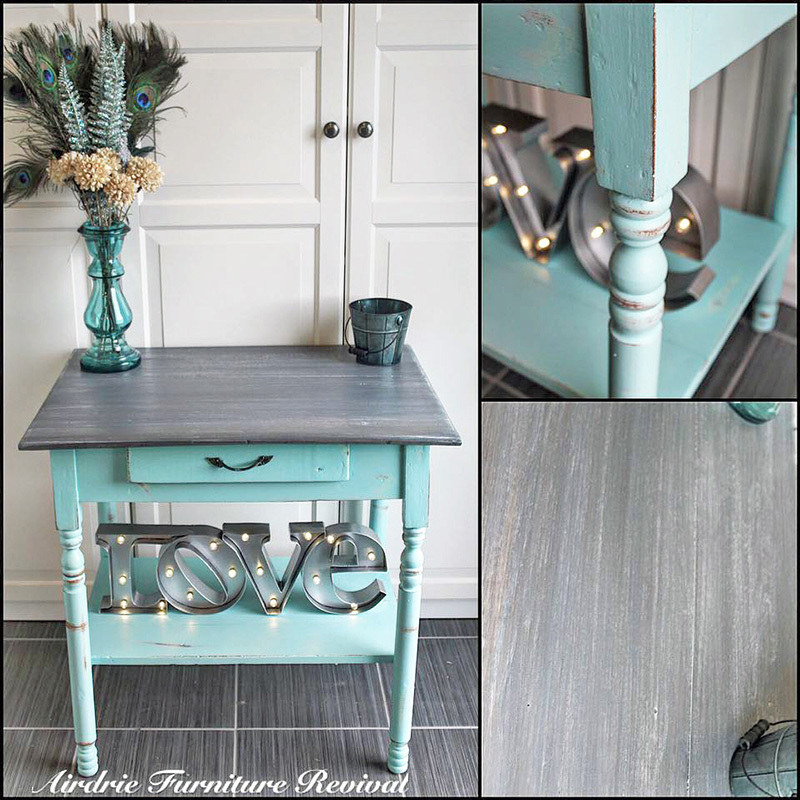 A weathered and washed look for your old table could be a thing of utter beauty in the house. 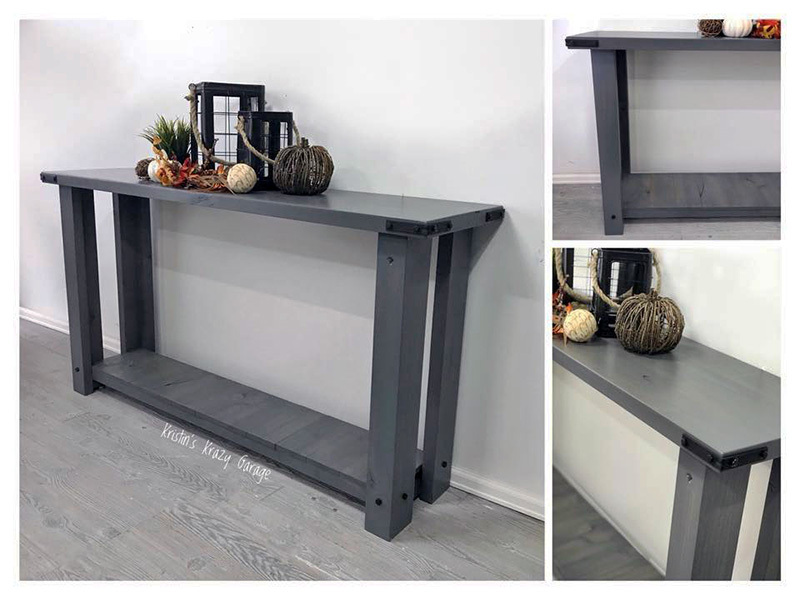 The look could be easily achieved with a lighter and textured gel gray wood stain applied to a sanded down vintage table top. 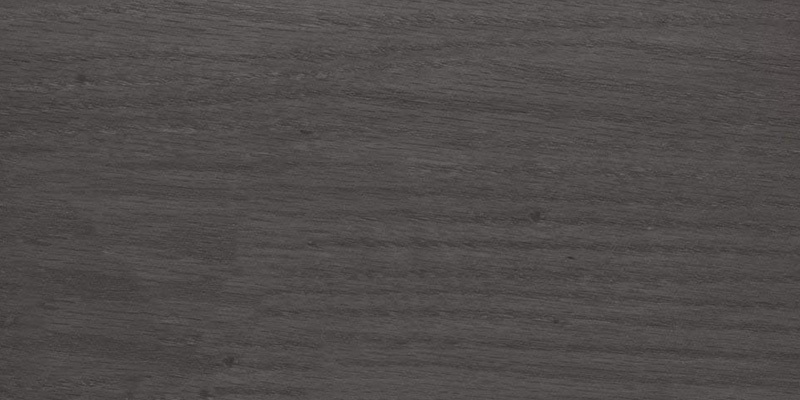 Numerous magnificent table-top designs could be created with gel gray wood stains. 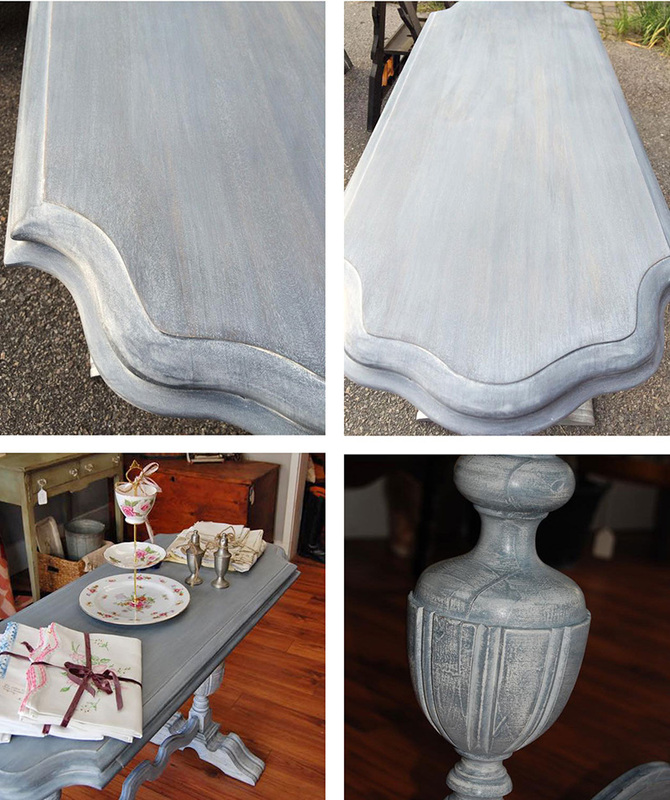 One of the most beautiful styles is a chalk-blue gray “beachy” design that can be created using a rich gel gray wood stain. 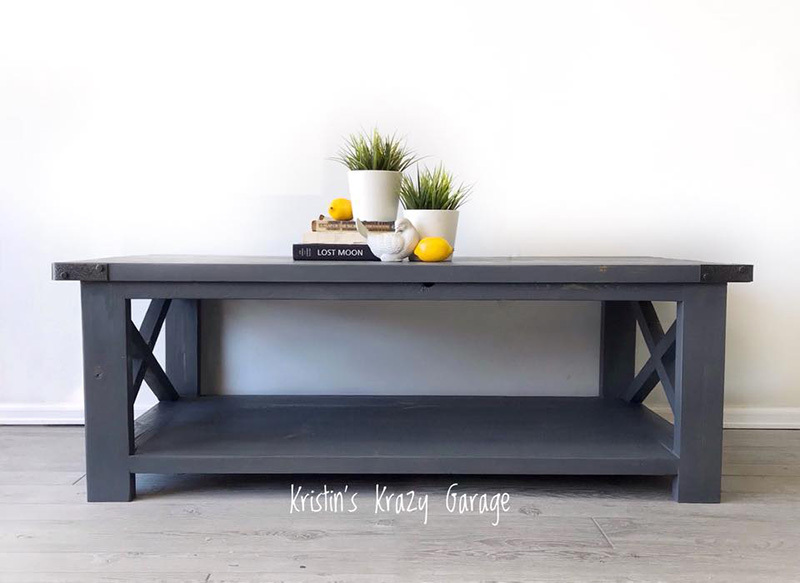 A console table or sofa carved entirely from alder wood can be given a stunning overall finish using gray wood stains in cooler tone. Furthermore, brackets and bolts could be added to the design to give it a more “industrial” look. 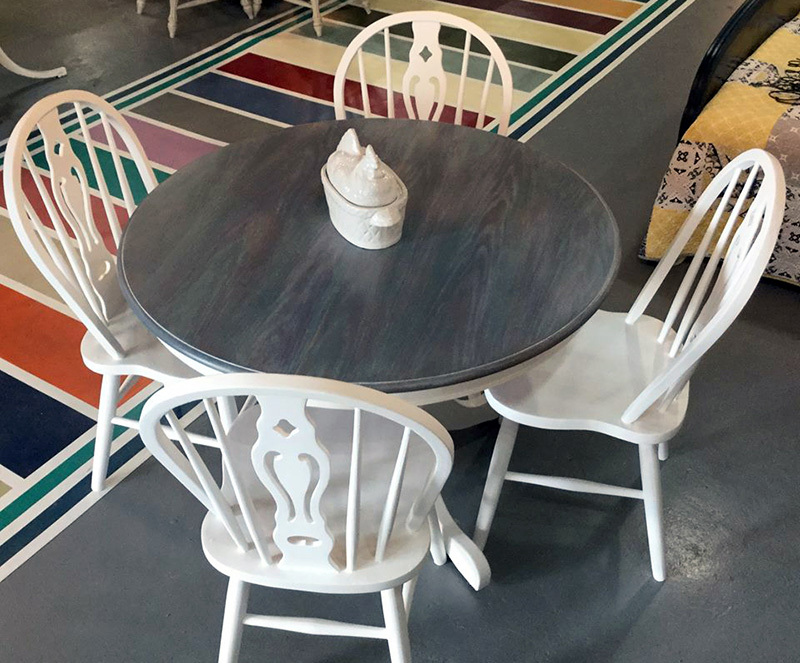 Although gel stains are usually recommended for applying on raw wood itself, a spectacular design could be created especially for dining tables using the “dry brushed” technique over white paint. Simply dry brush the gel stain over white paint after the surface had already been given its initial gel stain coats and wiped back. 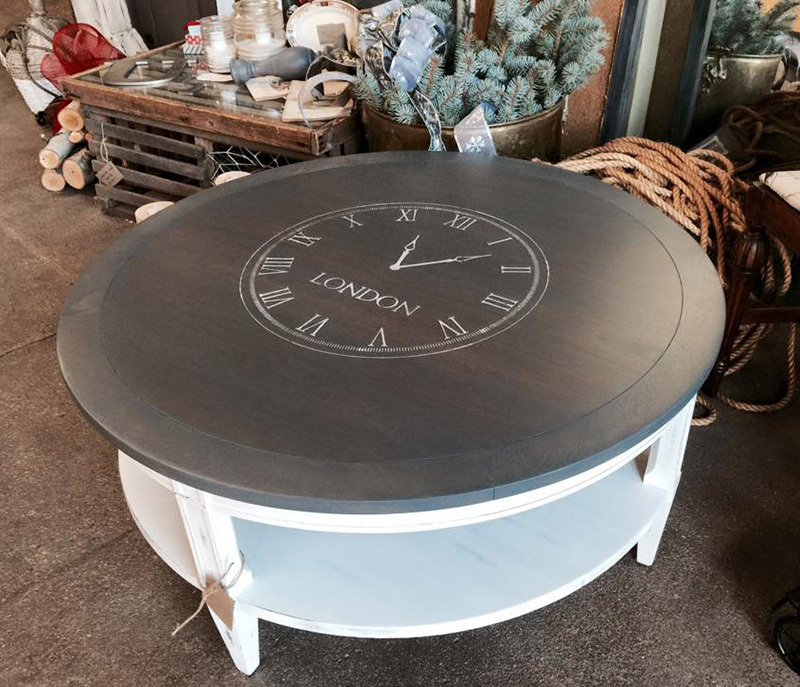 Create a coastal or driftwood-ish vibe by playing with multiple shades on a deep-grained round wooden table top. After applying the first coats of two different tones sand down well to reveal the beautiful dark, grainy textures. Add the next two layers and finally add a sealing top coat for a glamorous overall finish! A cherry coffee table seems to be the perfect creative idea for gray wood stain project. Not only does it look spectacular, but a few layers of protective gel stains can efficiently keep the thing from getting damaged by spillage and weathering. Pinewood pieces for table and counter tops look absolutely amazing done in gray wood gel finishes. You could play with around 3-4 tones for creating a classic shade for your yellow pine wood. Do not forget to gently sand down after applying the first two shades and finally topping the final coats with a protective water-based polyurethane coat. 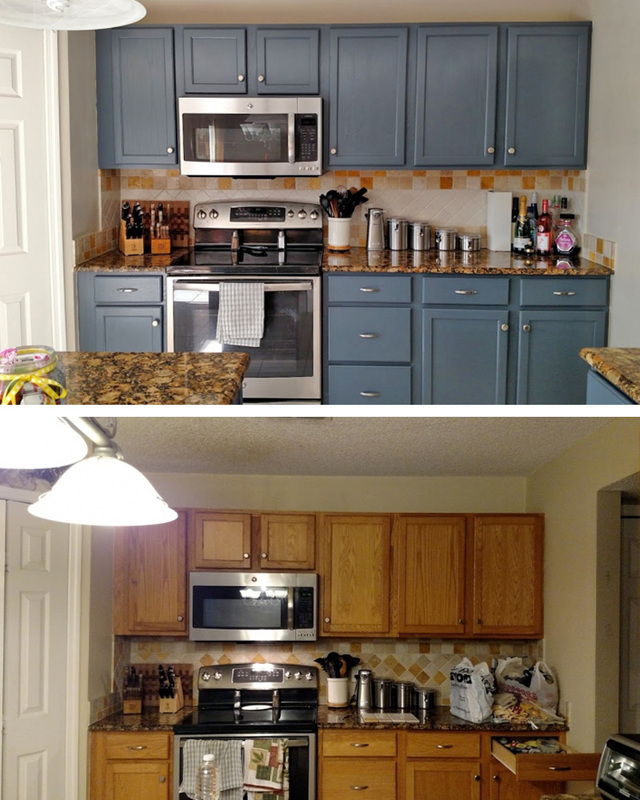 So this was all about what we had to say about fabulous gray wood stains for your furniture. We hope you liked this read as much as we loved writing it for you!